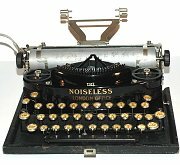 This site is devoted to the early history of the portable typewriter, from 1890 to 1930, illustrated by antique typewriters from my collection. The portable typewriter industry was born at the beginning of the last century. Famous names like Smith-Corona, Remington, Underwood, Royal and Imperial, flourished as globally recognised brands, and collectively the companies sold tens of millions of typewriters all round the world, changing office working habits forever. Yet by the 1990s, all the famous names had been overwhelmed by the computer revolution, and one by one went into liquidation or were bought out. Today, the famous name typewriter firms like Remington and Underwood are all gone forever. Yet curiously, the typewriters they made, their company logos, their instruction booklets, their magazine adverts, and even the disciplines they introduced to office life, remain behind like archaeological finds from a lost world. This site is my personal tribute to those companies, their entrepreneurs, inventors, engineers and salespeople, and my way of celebrating the passing of an invention that was an important part of my life as a writer and journalist. To explore the lost world of the portable typewriter, click any picture on this site. The era of the mechanical portable typewriter came to an end in 1957 when Smith-Corona launched the world's first electric portable machine. To read about this revolutionary typewriter and its impact. Our Latest Addition . . .